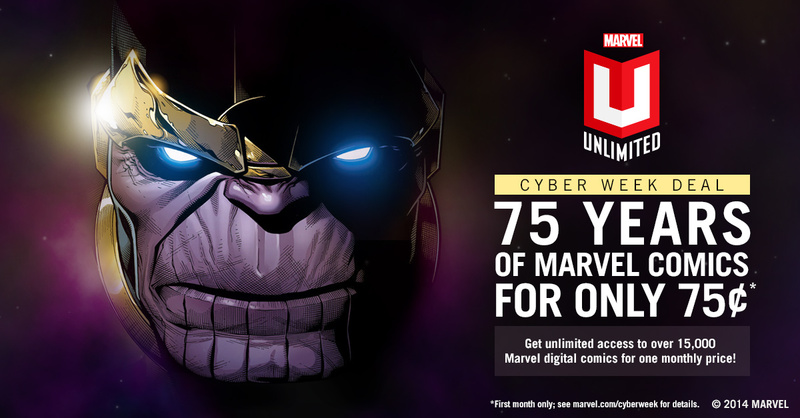 Marvel is celebrating Cyber Monday with Cyber Week, and is inviting fans to get in on a month of their Marvel Unlimited digital comics service for only .75 cents for the first month. If you issued out on this deal yesterday, then you’ve got another chance as Marvel is extending the savings for the full week. Basically, if you dig Marvel and love the history of the company’s characters and their universe, then you’re probably going to want to get in on this one. Right now, you can nab a month of Marvel Unlimited for only .75 cents USD, that’s 15,000 comics for less than a dollar. This deal is good until the 4th, which is this coming Thursday though. After that, the price will jump back up to normal. So if you’re a Marvel fan new or old and you’re no a subscriber as of yet, now’s the time to hop on the Marvel Unlimited bandwagon and give the service a shot for December. Click here to get in on the deal and input the code MARVEL75 at checkout to nab the discounted price.